InfoSAWIT, KOTAWARINGIN TIMUR – Four lecturers from Universitas Gadjah Mada (UGM), such as, Prof. DR. Ir. Mochamad Sambas Sabarnurdin M.Sc., DR. Sigit Sunarta, S.Hut., M.P., Ir. Kasmudjo, M.S., and Ir. Sri Astuti Soedjoko, had a chance to see in person the palm oil plantation cultivated by PT. Nusantara Sawit Persada (NSP), in District of Kotawaringin Timur, Central Kalimantan Province. Their goal was to see directly the functions of the area from the conversion production forests belonging to the government which were abandoned since 2009 and they are functioned as palm oil plantations. Director of NSP, Teguh Patriawan thought that palm oil plantation could be said as the palm oil forest because referring to United Nation, FAO, Kyoto Protocol, and Convention on Biological Diversity, forest could be defined as the field having more than a half hectareis planted by trees which the height could be five meters and the canopy could be minimally 10 percent. 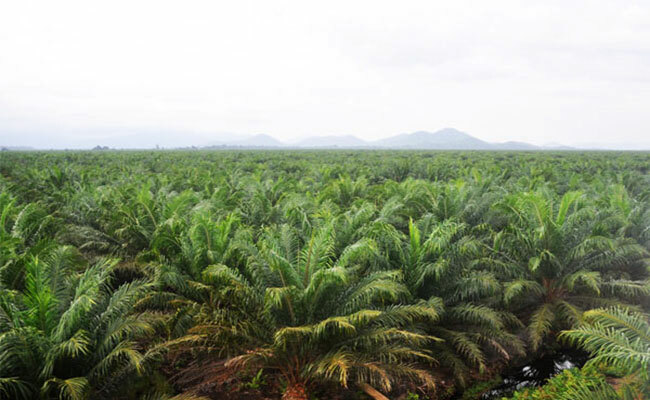 “The canopy of palm oil trees here is more than 10 (ten) percent,” Teguh said as InfoSAWIT recently quoted from Kagama.co. According to the forest definition from the international institutions, Teguh continued, palm oil plantations could be said as plantation forests. But because of certain political interest, he thought, palm oil is not categorized as the forest. As a matter of fact, the growth, the carbon absorption, and its role to increase the forest canopy globally could be the same as the functions of the conservation forests. Besides having the forest categories, palm oil is the commodity of the vegetable oil having high productivity. This is the surplus of palm oil. It makes palm oil planted in narrowest areas of all kinds of vegetable oil to fulfill the stock of vegetable oil in the world. “This is the chance to fulfill the additional demand in the world for vegetable oil and fat about 6 million tons and its productivity could be 8 – 10 tons compared to other kinds of vegetable oil,” he said. The Professor in Tree Breeding and Siviculture, Faculty of Forestry, UGM, Prof. DR. Mohammad Naim also said that palm oil productivity is not about the width of the areas. The trees having good bunches, he continued, could be developed in the net culture. In the genetic engineering, it could produce superior seeds and the rests of the areas could be advantaged to others. “The seeds would be the same and there is no variation,” he said. Teguh thought, the attacks of non-government organizations (NGOs) may take place for the competition of vegetable oil of theirs in the sub – tropical regions, and the less or no protection from the government to this industry. He thought, the discredit to palm oil industry could be as the black campaign from the competitors of vegetable oil industries out of Indonesia which do not want that palm oil industries in Indonesia to go better in the future. In their visit to the palm oil forest about 2.500 hectares, Prof. Sambas knew that NSP tries its best to nurse the environment. The agroforestry and professor in Faculty of Forestry, UGM knew the characteristic to nurse palm oil plantations just like maintaining the forest.